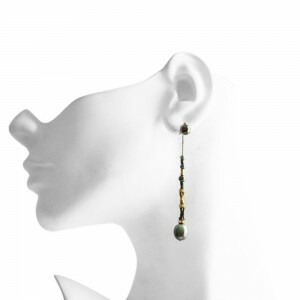 Earring mannequins generally feature heads, heads and shoulders, or they are either full body or half body mannequins. Their main goal is to display various pairs of earrings. They come in multiple sizes, colors, in both male and female form, and even children as well. Given that they are only head shaped, they can be easily accommodated everywhere around your store, from window display cases and glass show cases to any vanity, dressing table and so on. They will display any type of earring piece, from ear studs to intricate and large pairs of earrings. They are can suitable for chic and trendy earrings or for subtle and elegant ones. 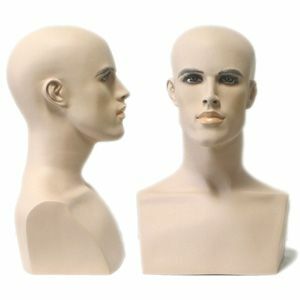 Their wide range of variety allows you to pick any kind of mannequin that will better fit your intended look. They are very convenient, space-saving and they will unmistakably present your pairs of earrings in an efficient and stylish manner. Necklace mannequins are usually neck shaped, but they can also feature full bodies or at least a torso shape. This type of mannequin comes in different sizes in order to fit various sizes of necklaces as well: they can be slim neck mannequins, thick/ sturdy, medium sized and so on. From small sized collars, necklaces to larger and more prominently sized neck jewelry, this kind of mannequin will definitely do a great and efficient job at presenting your items of jewelry before your customers. If they feature only the head and shoulders, they’re even more convenient cause they can be placed pretty much anywhere without taking up too much space. They are helpful and they come in handy; having necklace mannequins displayed around the store is definitely a must have, as necklaces are a crucial and very important item of jewelry as necklaces are highly commonplace and most often than not present in any outfit! 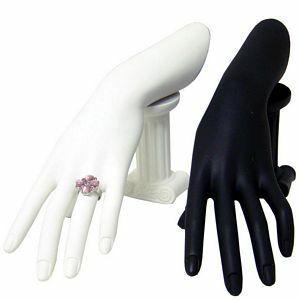 Ring mannequins are most commonly hand or arm mannequins, as their aim is to display rings. They can obviously feature full mannequin bodies just as well. They are meant to present various types of rings in a precise and efficient way, exhibiting rings as the highlight item of the display set. Ring mannequins are a delicate and dainty type of display and they should definitely not be missing from any self-respecting jewelry store. They are a small, yet important display mannequin and they offer a great look at your products. They present your rings with a special kind of grace and style and they make sure even the smallest item of jewelry will be admired by any customer or passerby. They are the best fit for the display of jewelry in window and glass cases as they will be undoubtedly noticed. Ring mannequins are not as large and significantly sized, but they are definitely a valuable type of jewelry display. Bracelet and watch mannequins are intended for the display of, obviously, bracelets, watches or arm bands. They usually feature arms, half bodies, torso mannequins or even full bodies. Bracelet or watch mannequins are perfect for both jewelry stores and watch stores. They aim at presenting your wrist jewelry in a better and more efficient way, shedding a graceful and fashionable dimension to your items of jewelry. They can easily embellish any environment and they are lovely and beautiful final touches when it comes to decorating indoors. Depending on their size and style, they will be easily accommodated even in more crowded window cases without taking up almost any space. Bracelet or watch mannequins are the kind of mannequin that is omnipresent in any jewelry store, so they are definitely a must have. They can be also found in various aspects so they can present your bracelets and watches in a more diverse and entertaining manner. Mannequins with makeup are a chic and trendy type of mannequins; as the name goes, they are decorated in various creative and attractive makeup styles in order to offer a more enticing and fashionable look to your items of jewelry. This kind of mannequin is often vividly painted in gorgeous shades and makeup trends. They are elegant, lovely and each one of them is one of a kind. They are available in a multitude of makeup versions, from subtle eyeliner and eyeshadow to lurid and extravagant makeup styles. They offer an abundance of color and designs to choose from. If you are aiming for a more outstanding look for your jewelry store, mannequins with makeup are definitely the best choice. They offer more expressivity than any other kind of mannequins and they will surely display any item of jewelry with style, class and impressive makeup skills. Flexible mannequins are a very convenient and useful type of mannequin; they are equipped with mobile joins or limbs, thus making them flexible. There are easier to bend in order to accommodate any kind of jewelry or to fit in differently sized places. Flexible mannequins are better suited for more innovative and intricate styles of jewelry display as they can be twisted in various ways in order to suit the intended design. They are definitely very helpful and handy to have around in your store. They are obviously available in many different colors and body types, therefore perfect for any kind of product display, be it male or female. With the help of flexible mannequins, you will be able to display your items in a more fascinating and captivating manner that will surely not go unnoticed by your customers! They are fun and entertaining and they will prove to be a very attractive way of exhibiting jewelry. Realistic Jewelry Mannequin Heads are the kind of jewelry that are meant to resemble the human body as much as possible. They have detailed features for a greater accuracy. Realistic Jewelry Mannequin Heads are intended for the display of head jewelry, such as tiaras, headdresses, necklaces and so on. This type of mannequin is perfect for all environments as they don’t take up much space. They come in many shapes and sizes but they are usually black, dark gray or white colored. 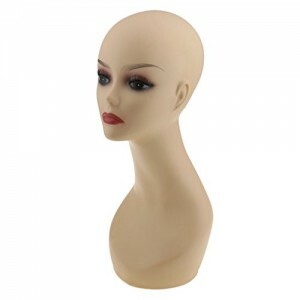 Mannequin heads are very efficient and useful in any exhibition set as they rightly present the use and look of various items of jewelry. They can be either used in jewelry stores’ window cases or you can scatter them around the store as a beautiful and elegant additional piece of decoration. Realistic jewelry mannequin heads are definitely the best way to have your jewelry stylishly presented before any customer. Abstract Jewelry Mannequin offer a fabulous and fashionable way of displaying jewelry. They are beautiful displays with diverse abstract designs that will shed an authentic and one of a kind light upon your items of jewelry. They vary in size, style, color and shape and they usually feature interesting and innovative designs. Abstract jewelry mannequins are a great way of attracting attention upon jewelry. They are most suited for the display of jewelry in stores’ window cases as they are surely going to create a very good and lasting impression upon each passer-by. Abstract art means plenty of creative and new displays of imagination so any abstract jewelry mannequin is definitely going to be unique in its own special way and present your items of jewelry in an exquisite and innovative manner. They offer a wide range of jewelry, such as rings, pairs of earrings, necklaces, bracelets and so on. 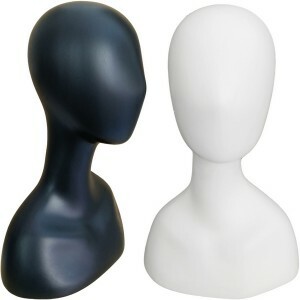 Egghead mannequins, as the name goes, are featureless jewelry mannequins. They usually contain a half body, full body or they feature a torso length mannequin. They are shiny, elegant and sure to stand out in any crowd. They can accommodate all types of jewelry items, from necklaces to pairs of earrings, headdresses, belts, tiaras and many others. They can be used as the main item of any jewelry exhibition set as they are definitely going to attract everyone’s attention. They can display plenty of jewelry, so they will prove to be very efficient and space saving as well. They come in multiple colors, but most commonly black and white. They are stylish, fashionable and definitely the right choice of display in any jewelry store. In addition to all that, they are just as suitable for the display of items of clothing as well and they will certainly brighten the interior of your store. Elegant mannequins are the perfect choice for any self-respecting jewelry store. They represent a token of good taste, grace and style! They offer a certain kind of elegance and class to any environment; therefore, they are ideal if you want to go for a sophisticated and fashionable look! This type of mannequin is attractive, striking and they will undoubtedly be noticed by any customer! They can accommodate all sorts of jewelry items, depending on their shape and size. They provide a beautiful and unique display of jewelry and they can even be considered an enticing and stylish item of decoration as well. You can place them in the window case in order to catch every passerby’ eye or you can have them arranged around the store for a better effect of elegance and style. They present a chic and classy way of displaying jewelry and they will certainly not go unnoticed! Vintage mannequins are always a gorgeous and fabulous sight to behold. They offer a beautiful and striking design and they are all a unique and attractive way of displaying items of jewelry. They come in many shapes, colors and styles as they are a living proof of the fashion trends of their days. They are ideal for a more special and exquisite display of jewelry and they as just as suited as items of decoration. They are perfectly placed in any jewelry window case as they will attract everyone’s attention. 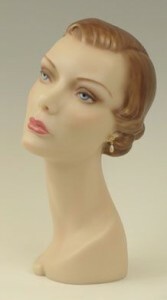 Vintage mannequins are certainly the style to go for if you’re looking for a more retro look for your jewelry store. Moreover, they also are the best gift for anyone who’s passionate about antiquities or vintage looking items and they will also be able to display diverse items of jewelry in a completely stunning and one of a kind manner. Genderless or abstract types of mannequins are very efficient and useful as they can be used to many purposes and they aren’t limited to just one category of display, like women’s products or men’s products and so on. Genderless mannequins have no defining characteristics; therefore, they can be used for any purpose, regardless of gender. Thanks to their neutral look, you can either use them to display women’s jewelry, such as earrings and necklaces, or men’s jewelry, such as watches, belts etc. Genderless or abstract mannequins come in multiples shades, shapes and body types. They are also great for displaying unisex accessories, such as hats, belts, rings and many others. They present the perfect opportunity of going for a more androgynous look and design in your jewelry store. They can accommodate any kind of jewelry item and they will surely prove to be very helpful when exhibiting various types of your products. Female mannequins are probably the type of mannequins that is most spread and commonplace amongst display mannequins. They are meant to display items of feminine jewelry, such as pairs of earrings, rings, head and foot jewelry, bracelets, necklaces and many others. They can be found in multiple styles, designs, colors and sizes, from body parts to full body mannequins. Given their customary use, they are obviously found in a large range of variety and pattern. They can go from antique or vintage looking mannequins to highly modern or abstract mannequins. Female mannequins are most commonly used in jewelry stores but they can be just as well intended as innovative and one of a kind item of avant-garde decoration. They will both display your items of jewelry while improving your interior decoration as well. Given their customary use, female mannequins are definitely the must-have kind of mannequin in every type of store. Male mannequins, as their name goes, are destined for the display and wear of items of jewelry intended for men’s use. This type of mannequin can obviously be found in multiple colors and sizes, varying from full body mannequins to half body, torso mannequins or specific body parts as well. They are meant for the display items of men’s jewelry, such as watches, belts, rings, arm bands, and even necklaces. They are perfect for the display of watches in specialized watch stores but they can be used in any jewelry store just as well. Varying on their design, they can be very stylish and suitable for any kind of decoration, modern, futuristic, vintage or fancy. They go well in complete male, female and children sets but they can be utilized on their own too. Male mannequins are definitely just as useful and fashionable as any other kind of display mannequin. Children mannequins are, obviously, mannequins destined for the use of children jewelry and accessory display. They come in smaller sizes in order to accommodate items intended for children’s use; they can also be found in various designs and colors to match any skin type. Children mannequins are less commonplace but they are just as valuable and useful. 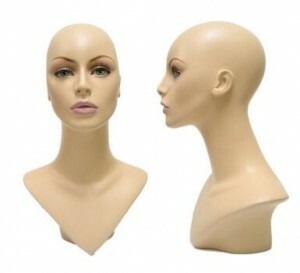 They are utilized amongst female and male mannequins but they can be used on their own just as well. Taking into account their size, they are definitely more space and time saving than the other types of mannequins, so you will be able to place them pretty much anywhere, in your window case, in your jewelry store etc.! They display any kind of jewelry meant for kids, from pendants to bracelets, belts, pairs of earrings and many others. While they are not just as regularly used as other mannequins, children mannequins have their own purpose in any jewelry store.